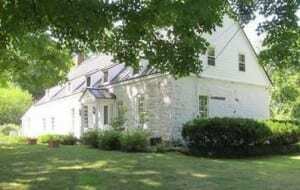 If Sarah (Hasbrouck) Osterhoudt was transported from the 18th century to her home today, she would recognize her actual stone dwelling and little else. Once the nucleus of a large and prosperous farm which remained in the Osterhoudt family for centuries, today the home sits on less than an acre and is crowded later development. The Osterhoudt house, located on a dead-end street in Lake Katrine, NY, is one of the oldest in Ulster County. It’s about five miles from the Stockade District of Kingston where Sarah’s eldest brother Abraham Hasbrouck lived. A considerable amount of information is known about the home Osterhoudt, but little is known about the lives of the occupants themselves, most notably Sarah. Sarah was born on February 21, 1709 in Guilford, NY, just outside of New Paltz. Roughly eight months after she was born, according to records of the Dutch Reformed Church, she was baptized in Kingston. Sarah was the oldest sister of Colonel Jonathan Hasbrouck (1722-1780). Sarah’s grandfather, Abraham Hasbrouck, was one of the founders of New Paltz known by local historians as “Abraham the Patentee.” His first son (and Sarah’s father), Joseph Hasbrouck, married Elsie Schoonmaker in 1706, shortly after he secured a large grant of land in Guilford. In the will of Joseph, which was transcribed by Kenneth E. Hasbrouck, Sr. (but not probated), he mentioned his wife: “[She would be] in full & ample possession of my whole Estate both Reale & personal & have the issues and Proffitts thereof so long as she Remains a widow.” If Elsie remarried, she would continue to remain in control of Joseph’s estate until their youngest child turned sixteen years of age. Their oldest son received his father’s farm and Sarah, along with her remaining siblings, was bequeathed 500 pounds. She would also receive a share of her father’s personal estate, including slaves. Elsie did not remarry and thus retained control of the entire estate until she sold the home and lands to her son Abraham on in 1754. Sarah was the third daughter in her family to be married. Her husband, William, was a widower who had been born in January 1703 (he had been previously married to Jannetje Traphagen in 1733). The couple wed in October 1737 in Kingston in a ceremony performed by Domine Mancius. William’s new bride was described by her brother Abraham as “well shapen, good features full visage or face, blue eyes, brown hair.” She took after the rest her family, most notably her mother, who was quite tall. In fact, her brother Jonathan was over six feet tall. Shortly after exchanging vows, the couple moved into the home which is today Lake Katrine, where their initials can still be seen today. It’s generally believed that the dwelling was much smaller at the time. According to William B. Rhoads, the original part of the house dates to circa 1691 and is believed to have been enlarged in 1740. According to Helen Wilkinson Reynolds’ Dutch Houses in the Hudson Valley before 1776 the home originally consisted of “one room, attic and chimney” and was enlarged “by the addition to the eastward first of one room, then of a hall and a room.” Reynolds reported that no date had been attributed to the middle portion of the home, however, in 2004 , the owner of the house claimed to have located a date under the whitewash. The Osterhoudt’s first child was born four years later, in April 1741, just after one of the worst winters in recent memory. As late as March, sleighs were still crossing the Hudson River and at times. The snow was four to five feet deep and drifts were so high that they needed to be shoveled away periodically. A second Osterhoudt child was born sometime around 1746. In October 1760, Elsie, the first of the couple’s children to get married, was wed to Thomas Jansen. The couple’s ceremony was also presided over by Mancius. According to Kenneth E. Hasbrouck, Sr., they relocated to Shawangunk shortly after the birth of the first of twelve children, in late December 1760. When Sarah was notified by her brother Abraham that their mother Elsie was very ill, she made the journey to Guilford. After an illness lasting about a month, Elsie died in July 1764 with all of her children surrounding her (except Rachel died in 1756). A service was held at the Guilford home and Sarah made the trip to New Paltz; her mother was laid to rest there next to her husband, who had died some four decades earlier. June 1770 was initially a good year for the Osterhoudt Family. William, who had suffered a stroke (a “numb palsy”), which had paralyzed the left side of his face the year before, appeared to be recovering. His only son Joseph married Sarah VanGaasbeck in Kingston, but the family suffered a setback during those same months when “worms, which destroyed a great deal of wheat, rye, barley, and grass, [so] that no great burden of hay was cut, [it] being devoured by the worms.” Then, an early snow contributed more damage in October 1770. Perhaps the hardest blow to the family was when William died in the early morning of April 18, 1772. He was buried at the Dutch Reformed Church graveyard in Kingston. In May 1779, Sarah’s brother Abraham noted that she started to suffer from “a hysterical disorder in short, [she] had a complication of disorders.” She would remain confined to her bed for the next eight months. She was visibly uncomfortable with pain in her “breast or stomach.” Abraham described his sister’s “legs, left hand and feet as swollen” for much of January. If she was corpulent later in life, her illness left her very gaunt. She died at two o’clock in the afternoon on Monday January 24, 1780. Regarding the Osterhoudt’s home, Reynolds wrote that it remained in William’s family until 1796, eventually ending in the possession of a relative, Peter Osterhoudt. By the 1920s the home was no longer in the Osterhoudt Family. Photo: The Osterhoudt house today. I enjoyed your blog on Sarah Hasbroeck as it added a lot of information I did not know. I am not a descendant of Sarah and her husband Willem but my interest lies in the house. I am trying to prove that the house was originally the house of Willem Traphagen and was on his property, granted in the 1670’s and confirmed to his sons in 1688 and the house and land came to Willem Osterhout by his marriage to his first wife Jannetje Traphagen. I believe the Peter Trapahagen who owned the house after Joseph Osterhoudt was likely a son of Willem O and his first wife Jannetje Traphagen. Thank you very much for you comments. The house is for sale I believe. I once read that there was a hidden room behind the fireplace. I never have seen the reference again. Thank you for this interesting article. My husband and I live in the old house. We have restored it over the past ten years. It is currently for sale. I have a lot of history about the house. I believe that the last Osterhoudt to live in the house was James and he sold the house and acreage to William Trueman and F. Harris of New Haven, Conn. in 1905. Anita Trueman Pickett inherited the house from her father. She was a Unitarian preacher who willed the house in 1960 to the Unitarian Fellowship, later becoming the Unitarian Universalist Congregation of the Catskills. The church functioned out of the house for a few years before reverting to private ownership. We have never discovered hidden rooms or date stones but we have discovered an old casement window frame. There is a small cemetery about three houses to our west (in someone’s backyard) where some Osterhoudts and other families are buried. It’s referred to as Osterhoudt Ground. Thanks to your article, I now know where Sarah Hasbrouck and her husband, William Osterhoudt, were buried. Thank you so much for your comments. It is a great house! If you would like to do a follow up on the house with pictures of the inside and additional history that would be awesome!I have always been curious if there is a hidden room behind the fireplace? Someone once told me that. It was in case of Indian attacks? I have also written quite a lot about Sarah’s family including a book published about her brother Colonel Jonathan Hasbrouck. I saw that the house was for sale and if I lived in New York would likely be interested. My interest in it is that I believe it is older than believed and the west sections were built by members of the Traphagen family who owned the 100 acres around the house. Willem Osterhoudt evidently came into possession of the house and property when he married his first wife Jannetje Traphagen. After Willem and his son Joseph occupied the house it came into possession of a Peter Osteroudt but I find no record of a land transfer. Peter is buried in the Osterhoudt Cemetery near the house and i believe he was a son of Willem Osterhoudt and his first wife Jannetje Traphagen. My name is Markus Oosterhoudt, for years i am searching for the history of my fam name. I am from the Netherlands and my fam is not that big, so maybe a part of the Oosterhoudt fam moved to new york (ulster) during the reformation in 1700. I know that my fam was from the reformed church, and people in brabant were almost forced out to move to the north of the Netherlands. My fam ended up in friesland in the netherlands. A long time ago i saw a picture of the dutch reformed curche in Ulster with a tombstone with the name Oosterhoudt…..i dont know what to think……but there is even een lane called NW Oosterhoudt lane….and many people last name in that earea are oosterhoudt, osterhoudt, or van oosterhout. its intresting to read about history………..
My friend’s, the Fairchuks, lived in the house in the 1970’s. They told me about the hidden room but I never saw it for myself, They also told me about an escape tunnel that had been filled in and hidden compartments in an upstairs room. Wish I could confirm actual locations!